NEW! Zesty Orange Sweet Potato Stir-Fry with Garlic-Lime Soba Noodles 🔥🔥🔥 This dish is easy, only takes thirty minutes, and is ttoottaallyyy satisfying 🤤 Spicy, hearty, and refreshing wok-tossed veggies alongside tender noodles seasoned with thick & sweet mushroom oyster sauce, aromatic sesame oil, and deep soy sauce ✨ LINK TO TONIGHT’S DINNER PLANS IN BIO! We took a tempura sweet potato roll, dissected it, and made this 🔥 Loaded Crispy Sweet Potato Chips with Tempura Fried Seaweed, Sautéed Beef Crumbles, Sweet Eel Sauce, and Spicy Mayo 🤤 When that first bite hits your mouth, your eyes are persuaded to roll back into your head, your mouth involuntary ushers the words "oh my godddd," and you immediately check your pulse to ensure this is, indeed, real life 💕 LINK TO RECIPE IN BIO! Before we get to today’s topic... HERE’S A PHOTO FROM THE @VEGOUTLOSANGELES MAGAZINE RELEASE PARTY YESTERDAY! 🎉 If you live in the LA area, check out their page, read some articles on the site, or pick up the new magazine at a local shop around the city! ✨ ....................................................... Alright, now for today’s news... For the time being, we’re dropping down the amount of posts we publish to once a week. I know, sad face, right? We’ve got several reasons for doing this, so we’ll try to let y’all in on as many as we can. 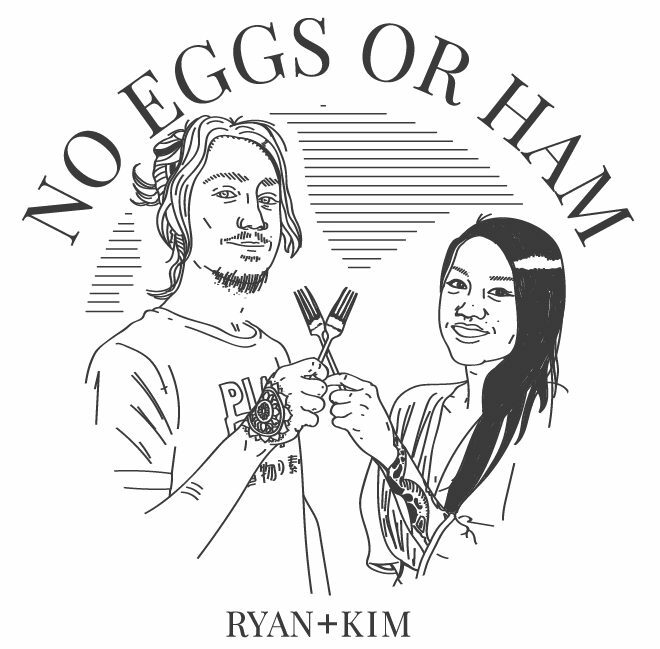 For one, as much as No Eggs or Ham fuels our souls, excites us to share food, and inspires us to create more, we uh, we don’t get paid to do this. Sure, we make a very smol amount of money each month, but it certainly ain’t enough to cover the amount we spend on recipe testing. Reason number two plays into reason number one: we don’t make enough money elsewhere to support our recipe testing at full capacity. If we were millionaire entrepreneurs, drug dealers, or strippers, it may be possible but uh… we’re not doing any of those (yet). Reason number three has to do with the most important currency of all: time. Like we said, we LOVE doing this, but we’re still struggling young kids scraping by to make rent in Los Angeles. Being a “blogger” is cool, but we still strive for the financial freedom to travel, purchase new props, and fund other projects. On top of that, No Eggs or Ham isn’t the only artistic endeavor with weekly commitments Kim and I have. ......................................................... All of this to say, by alleviating one post a week from No Eggs or Ham, we’ll have more time to balance out the rest of our lives, from other artistic endeavors, money making time, and straight up relaxing time (which we don’t get much of). We know a lot of you guys look forward to every recipe we post and for that we are so grateful! Albeit, by giving ourselves more time with each recipe, we hope to bring y’all better photos, better writing, and better food. ............................................................ BUT LETS END THIS ON A CLIFFHANGER: WE’VE GOT BIG NEWS COMING LATER THIS WEEK. Pro tip: paratha > tortillas for tacos ANY DAY ⚡️ These smoky, grilled eggplant tacos with maple roasted cabbage, cilantro coconut yogurt sauce, and roasted peanuts SOUND A LITTLE BUT CONFUSING, WE KNOW. But they taste like... well, they taste like nothing you’ve ever had before, in the best way possible 🙌 Idea inspired by @goa_taco of Smorgasburg, who serves up our FAVORITE vegan taco in all of LA 🔥 Link to this one-of-a-kind dish in bio! How to Make Blanched Almond Butter and "Do Almonds Have Lectins?"